CCC Construction is a premiere construction company working closely with homeowners to create the home of their dreams. CCC Construction’s process begins with one on one consultation and guidance from start to finish. The owner is on the job site daily. All houses are built by professional carpenters, not from a factory, ensuring your vision is seen in special touches as you are allowed to participate in every step of the way. This unique, customer oriented approach has allowed CCC Construction to become the area’s premier custom home company. With over 25 years experience in the construction business, owner Frank BiBacco has the knowledge, skills, and ability to help families create their forever homes, remodel, or add-on to their existing home. Every good business wants to present a positive image to new and existing customers. CCC Construction is no exception to this rule and enlisted 3PRIME to design and build their brand new website. 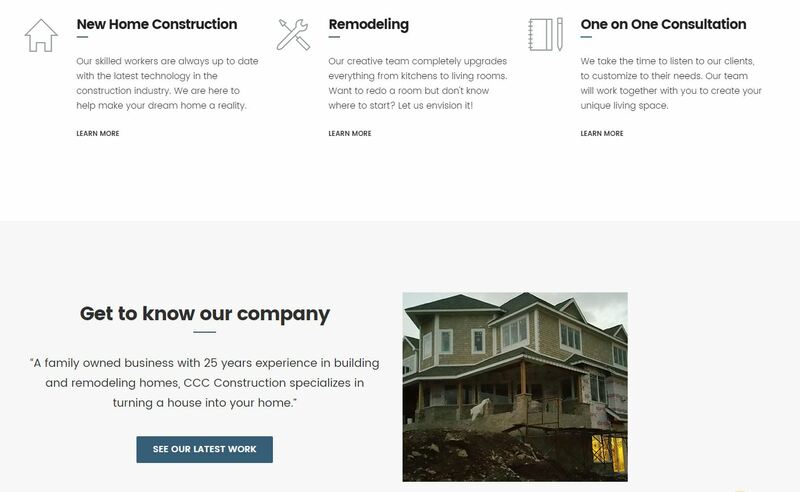 We created a mobile responsive, user-friendly website for CCC Construction with an emphasis on search engine optimization, branding, and business and marketing goals. We used a customizable WordPress platform along with search engine marketing tactics to create a website that will attract and retain customers. We implemented Google Analytics for CCC Construction in order to help them better understand how the website was performing. 3PRIME built the new site to ensure that it was responsive for mobile users, allowing mobile users to interact with the site and have a positive experience. 3PRIME is hosting the CCC Construction website. 3PRIME knows how important it is to have someone you can trust and turn to for advice and troubleshooting when necessary. Hosting the site allows 3PRIME and CCC Construction to continue working together and collaborate on any issues, changes or problems that arise.